← Can anyone become gifted? Myth or Truth? 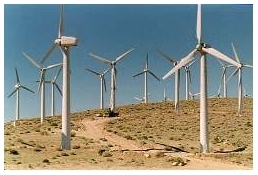 According to the Global Wind Energy Council there were over 70,000 MW installed throughout the world by the end of 2006. That proves wind energy to be the fastest growing source of energy, and is expected to see continued strong growth in the nearest future. Another statistical piece of information according to the World Market Update by BTM Consult ApS in Denmark projects wind power to provide a total cumulative world-wide capacity of 117,000 MW (roughly 1.25% of the world’s electricity generation) by the year 2009. As wind capacity continues to grow, compliance with interconnection criteria and power quality becomes increasingly important. In many cases, dynamic voltage and power factor control are required to comply with electric utility requirements, still maintaining reliability in power quality and stability in wind farm revenues. Developers, operators, and utilities face many challenges when interconnecting large, distributed sources of generation with fluctuating output, such as wind energy. These challenges come in many forms. Generally, majority of power plants, presently connected to power grids, are consuming reactive power due to their inductive loads, such as electric motors. To comply with their demand, a reactive current is consumed from a power generator that powers the grid. In such a case, reactive power compensation is required in order to sustain the power quality of the grid. Utilities demand this compensation to be produced by wind farms. When a wind farm operator follows this request, he is facing a dilemma: producing capacitive compensation of the grid power factor will reduce wind farm revenue due to the fact that the wind farm is not getting paid for the reactive power produced compare to the active one. Typically, utilities are requesting to maintain a constant voltage from a wind farm. Most of the time, utilities are asking for a specific power factor or a reactive power delivered to the grid. Occasionally, they might even request a constant current for some remote locations located away from the main source of electric power being ether hydro, combine cycle, thermal, or nuclear, etc. Unfortunately, this kind of wind farm control features are not yet readily available. Other kind of control may also be required, such as: constant reactive power or constant phase-angle. 1. As it widely known, an electric power can be described as a triangle, whereby each side corresponds to a different type of power: Active Power (also called useful power), Reactive Power (also known as imaginary power, capacitive or inductive, leading or lagging), and Total Power (also known as apparent power), as shown on the diagram below. The only difference is that the power factor becomes positive when reactive power is inductive by nature, and it becomes negative when reactive power is capacitive one. In the first instance a wind farm should compensate inductive power vector by generating an opposite power vector, or producing capacitive (leading) power. In the second instance the wind farm should produce a surplus of inductive power, above and beyond the amount it consumes from the grid due to the nature of induction type generators used. In both cases, regardless how much inductive or capacitive power is producing by a wind farms, the farm doesn’t get pay for it. The challenge will be to comply with utility requirements without adding any additional capital expenditure to the overall cost of the farm. Another challenge, which becomes very common these days, is keeping wind turbines online under low voltage conditions of the grid, at least for a fraction of a second. It is also very important to protect wind farm from any overvoltage, which might occur, or from voltage transients (spikes) developed within power system (the grid). Transient voltage events that drop grid voltage below wind farm set-point levels can cause generators to trip off-line. Most interconnection standards today require wind farms to have the ability to ride through faults (Low-Voltage-Ride-Through capability). Below is a real case study how it can be accomplished by simply creating “smart delay”, while transient is still present. Finally, the biggest challenge of all is to combine all possible modes of a wind farm controls into one, which offers either automatic control of the farms supplied power or it could done by demand (command or automatic override) by a wind farm operator, or even remotely by the utility operator. The only requirement to have a multi-mode control of a wind farm is to have so called “Bumpless Transfer” from one mode to another, as it will be discussed below. This type of control has been proven successful by firing over 100 wind turbines farm, 1.5 MW each located in Indian Mesa, TX for the first time in North America. Generator Converter is a constant-output-voltage three-phase AC-to-DC converter. A Grid-side Converter is a three-phase DC-to-AC inverter. It has a built-in pulse-width modulation control algorithm and it provides a phase-angle control capability. A single-phase resistive load (for example: a heater) is controlled by an electronic switch (triac or SCR), which allows switching this load on and off anywhere within an AC cycle. When the heater is turned on at the beginning of the cycle, voltage and current are in-phase and an angle between them is equal to zero. In this case a power factor meter, connected across the load, will read unity “1” or 100%. The load will appear fully resistive, as it is. When the heater is turned ON later in the cycle, then voltage and current are not in-phase anymore. To understand this phenomenon you need to observe an area occupied by voltage and current independently from each other. As you can see, a centre of the “gravity” of voltage area, which is occupying the whole cycle, is located to the left from the centre of “gravity” for the current, which is occupying only a portion of the cycle because the current starts later in the cycle. From this diagram it becomes noticeable that the centre of the area, where current is conducting, is artificially shifted to the right from the voltage centre of “gravity”. Under this condition, an angle between voltage and current is not equal to zero. In fact, measured by a power factor meter, the load will appear to be inductive, instead of resistive. Power factor in this case will be positive and less than 100% depending on the time the load is turn-on, compare to the beginning of the cycle. When the heater is turned OFF later in the cycle, then voltage and current vectors become reversed: current is not longer present at the end of the cycle, while voltage is still there. The current in this case becomes leading in respect to the voltage. Measured by a power factor meter, the load will appear to be capacitive, instead of inductive or resistive. Power factor in this case will be negative and less than 100% depending on the turn-off angle. From this description, it can be seen that by firing a load later in the cycle or turning the load off later in the cycle, we can control reactive power of the load. 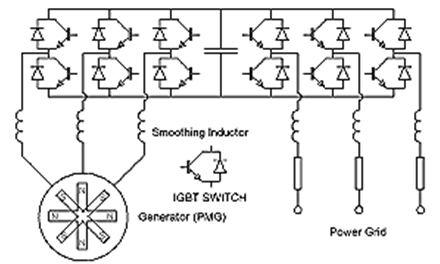 In modern wind turbines, equipped with power electronics consisting of high voltage switches, like IGBT, as well as adopting pulse-width modulation with phase-angle capability, we can easily achieve production of reactive power, either inductive or capacitive. This solution has been successfully implemented for Enron Wind for the first time in North America back in 2001 by the writer of this article. It is known fact that any wind turbine is rated in megawatts (MW), not in MVA. There is a reason for it: a wind farm is getting pay only for an active power “P” produced by the farm and delivered to a grid. Then what is the actual MVA rating of the turbine? Can it be utilized in such a way that reactive power, produced by the turbine, is apply for improving power quality of the wind farm? Yes, of course it can! Not only that: an additional capability of a wind turbine producing reactive power can be applied directly of improving quality of power by adding some useful feature discussed later in this article. One of those features is a Zero Reactive Power (0RP), which produces maximum revenue to the farm. Why is power quality so important for renewable energy industry? The complexity of power quality issue in electrical systems (not a part of this article) requires a very deep knowledge of electrical production, transients, non-linear behavior of electrical systems and a power grid. The following short list provides an insight into power quality problem: harmonic distortions (voltage and current), voltage sagging, current swelling, power interruption, lightning, fluctuation of voltage and current, variation of power factor, oscillation, etc. Some of these power quality features, such as an ability to produce reactive power and a low-voltage-ride-through become mandatory these days. Based on the recently developed and successfully tested concept of wind farm power quality maintenance and control, several most critical aspects of power quality, in respect to renewable energy industry, will be discussed below. Until now, only known power quality control utilizing phase-angle capability of a wind turbine (using internal wind turbine power electronics) is offered by GE Wind Energy, a new entity that replaced Enron Wind several years ago. GE solution allows only voltage control of a wind farm at the point of interconnect by merely creating a feed-back loop from a grid voltage output by changing the phase-angle between voltage and current of the turbine. A control system must take care of other type of power quality parameters, such as constant current, constant lagging or leading power. This systgem has been developed and successfully tested. Below is the description of a Total Power Quality Control (TPQC) system, which has been designed, implemented and successfully tested on over 200MW power. This system is presently installed in a half of a dozen US states. The drawing above represents a simplified block-diagram of the system also includes embedded control algorithms that provides the most comprehensive power quality wind farm control system in North America. Mode of Operation: Description Mode No. The last mode, as it will be discussed later, generates the maximum revenue from the wind farm. A very unique and very attractive mode (from a wind farm operation point of view) has been developed and successfully tested in Indian Mesa, TX. The idea of generating nothing but active power requires special programming efforts, entirely based on the physics of the electrical power fundamentals, that is: close-loop feed-back and a phase-loop control algorithms. In addition, any control transfer from one mode to another would require another algorithm, which would be dealing with a new “neutral” mode. That mode, invisible to the operator of the farm, would bring all set points (voltage, current, power factor, angle, reactive power) to initial, or neutral, condition whereby any control mode should start from. For example, if you need to go from a constant voltage mode (CVM) to a constant phase-angle (CAM) mode, then all set points should be changed from tens of thousands of kilovolts to an angle values between -25deg to +25 deg (positive and negative). A considerable bouncing of output voltage during mode change must be reduced and/or eliminated altogether. A newly developed Bumpless Transfer Algorithm (BTA) has been developed and implemented. This unique solution has never been done in electrical power industry before. The critical path in BTA has been attributed to steady-state condition, dedicated to each of the seven modes described above. It means that the entire control system should be brought to a predetermined initial state prior to any control mode being commenced. In addition, each and every control mode of operation required dedicated proportional, integral and derivative (PID) continuously running loop-control and/or cascade-loop algorithms. Those PID’s needed to be configured with different set points, different ranges of control and another dozen of parameters, which should be accurately activated prior to the operation of those PIDs. Finally, all modes of operation have been programmed with the BTA and successfully tested. No bouncing of values, such as KV, KI, MVA, MVAR, KW, KVAR, PF or Deg for all three lines, as well as the total 3-phase reading have been observed. The Zero Reactive Power Mode (0RP) of operation may become a very lucrative solution to all existing wind farms. Until now, it was very difficult to change parameters of a wind farm in order to compensate reactive nature of a grid without introducing any reactive components, such as inductor and capacitor. An extra revenue from a wind farm is obtained by the difference between the amount of active power produced by the wind farm and its highest possible value will represent farmat any given. It has eenb mentioned above that every wind turbine is designed to have its total apparent power rating (S) greater than its active rating (P). Based on the industry standard, if a wind turbine should have a minimum of 92% power factor, the other 8% of total electric power is still available for converting it into the active power, which is producing and extra revenue. Based on 1.5MW turbine, it is 8% from 1.5MW or about 120KVAR of reactive power. By modifying firing angle of the wind farm towards compensation of those 120KVAR we can obtain additional revenue, which accunts for about $40,000 per year (based on $0.045 per KWHR). A wind farm with 20 turbines will produce an extra revenue of over $800,000 per year by using this approach. Additional revenue is obtained by constantly maintaining zero reactive power, as accurate as +/- 10KVAR or better. Reprogramming of any existing control system could be done without adding any new control system. Emil Sagal is a registered professional engineer with Masters Degree in Electrical Engineering, and over 30 years of progressive hands-on experience and expertise in consulting engineering, project development, R&D, applied physics, process controls, instrumentation, electric power, renewable energy, telecommunication, computer science, PLC and SCADA programming, technical problem solving, technical writing, teaching and training. He is also an inventor with hundreds of inventions and dozens of patents in industries, such as: power generation, plant automation, metallurgy, automotive, environment, mechanics, bio-engineering, power electronics, etc., capable of inventing on-demand. Working independently for several consulting engineering firms, such as Raytheon, Bechtel, Lavalin, Acres, Davy, Fluor Daniel, and others in Canada, the USA and overseas, Emil Sagal successfully completed hundreds of industrial projects from conceptual design to completion. He is known for his inventive approach to technical problems solving by combining selected solutions from different industries and sciences assisting him in obtaining technical breakthroughs in many engineerig disciplines. This entry was posted in Electricity, Extra Revenue from a Wind Farm. Bookmark the permalink. I need help with a P&ID for a wind turbine power generator for a master’s project I am working on. I would expect a contol loop for wind direction and wind speed. Can you help with the control loops, sensors, etc.? Nice writing:) will definitely visit again! !